Other mobility options in cities have become more available, attractive, and increasingly used. While the rise of car sharing, ride-sourcing, bike sharing, etc. are generally still too small to measure, walking, biking, and even transit are holding their own or growing compared to the automobile. Transit use is up nationally due to the large investments in rail lines, that 20 percent increase in transit use in the decade (amounting to about 1 percent of all travel) is far less the 10 percent drop in per capita passenger travel by motor vehicles (about 8 percent of all travel). Recapitalizing transit has had marginal effects. Rather, the decline in per capita auto use is a death of a thousand cuts rather than one clear perpetrator. Walking, biking, school bus, and telecommuting are also all up. Some of that is due to changing preferences, some to the economy as discussed in earlier sections. School buses are likely due to changes in schools (which are bigger and farther apart) and increased movement away from the neighborhood school. 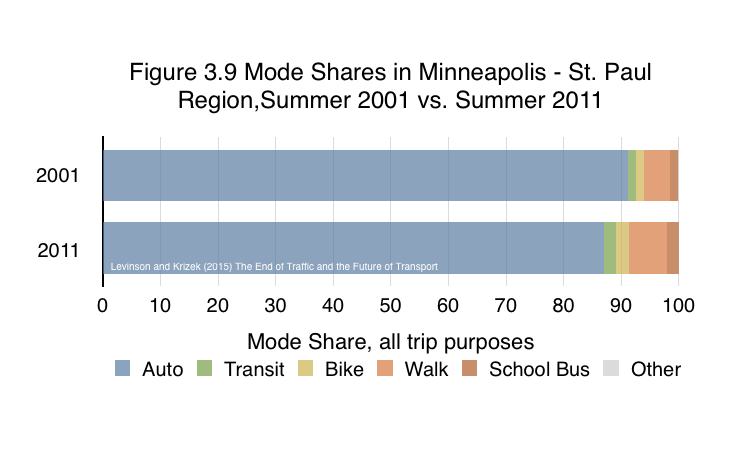 Illustrative data for the Twin Cities is shown in the FIgure. Figure 3.9 Source: Schoner, Jessica, Greg Lindsey, and David Levinson (2015) Travel Behavior Over Time. MnDOT Report.